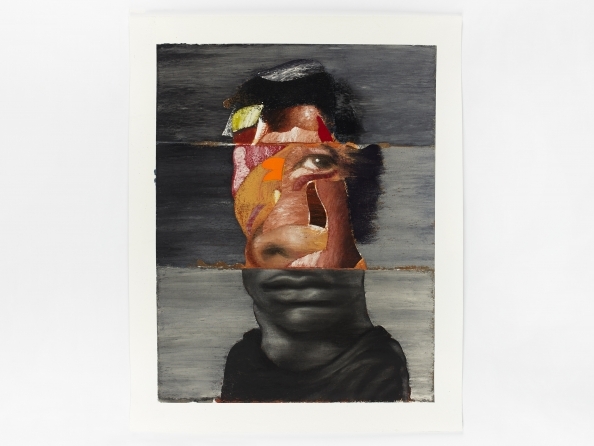 Nathaniel Mary Quinn, Uncle Dope, 2017, Black charcoal, gouache, soft pastel, oil pastel, and paint stick on Coventry Vellum paper, 24 x 17.5 inches. 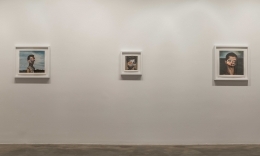 Rhona Hoffman Gallery is pleased to present “Nothing’s Funny,” Nathaniel Mary Quinn’s second solo exhibition with the gallery. Nathaniel Mary Quinn renders abstract-figurative portraits in a distinctive process that combines pencil and charcoal chiaroscuro, gouache, oil paint, oil stick, and acrylic on a single sheet of thick Coventry Vellum paper. Masterfully rendered facial features, skin, and clothing textures are fractured by flat areas of bold color, painterly brushstrokes, and crisp patches of acrylic gold powder. The works' material amalgam echoes the beauty, richness, and melancholy of the human experience. Nathaniel Mary Quinn draws visual inspiration from art historical references such as Vermeer, Rembrandt, Synthetic Cubism, Surrealism, as well as contemporary visual culture and magazine pages; however, his visages always respond to a highly personal narrative and the present moment. Comedy, a survival tactic the artist used to persevere a challenging childhood in one of Chicago’s worst public housing projects, plays a central role in “Nothing’s Funny.” As a boy, Quinn listened to records of black comedians with his father. “Nothing’s Funny” pulls together the humor and acuity with which comedians like Richard Pryor, Red Foxx, Rudy Ray Moore, Dave Chappelle, and others captured the joys, traumas, desperation, highs and lows of black American life. “Uncle Gus” references a raucous, unbalanced character from Eddie Murphy’s iconic 1983 stand-up special “Delirious;” while “Lit Match” recalls the late Richard Pryor’s raw revelation of his own downfalls and struggles with drug addiction. Just as comedians use story-telling, personal cadence, and delivery to astutely expose and bring light to tragic and dark moments; Nathaniel Mary Quinn features soft surfaces undercut by a bold slash of color, a facial feature cut askew, or the inclusion of animal elements like a horse hoof or lion’s mouth to portray the grotesque beauty of lived experience. Nathaniel Mary Quinn (b. 1977, Chicago, IL) received his BFA from Wabash College and MFA from New York University. 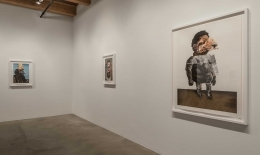 Solo exhibitions include Back and Forth at Rhona Hoffman Gallery, Chicago; On That Faithful Day at Half Gallery, NY; Highlights at M+B Gallery, Los Angeles; Past/Present at Pace Gallery, London; Hybrids: The Windows Exhibit at the Museum of Contemporary African Diaspora Arts, New York, and The Magic Stick at Rush Arts Gallery, New York. Upcoming group exhibitions include the Museum of Contemporary Photography at Columbia College, Chicago, IL and The Drawing Center, New York, NY. 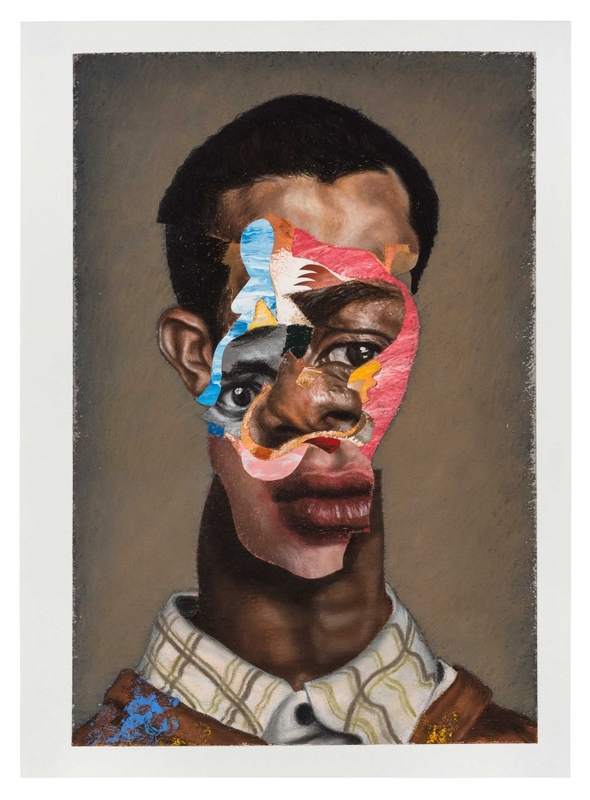 Quinn has also participated in the thematic exhibitions, Unrealism, organized by Jeffrey Deitch and Larry Gagosian, Miami; AIM 23 at the Bronx Museum of the Arts, New York; and Still/Moving: Photographs and Video Art from the DeWoody Collection, Norton Museum of Art, West Palm Beach. In New York Magazine’s April 2016 issue, Jerry Saltz selected Quinn as one of eleven artists “poised to have breakout years.” Other recent press includes The Independent (London), Modern Painters, ARTnews, Los Angeles Times, and Huffington Post. His work is in the collections of The Art Institute of Chicago; the Whitney Museum of American Art, New York; Museum of Contemporary Art and Hammer Museum, Los Angeles, CA; The Hall Art Foundation; Colby College Museum of Art, Waterville, ME; Pizzuti Collection, Columbus, OH; and Sheldon Museum of Art, Lincoln, NE, among others.